Shayla Smothers wins the tip for Black Hills to start the game against Chehalis. As the only returning starter, Shayla Smothers knew she’d have to become her team’s go-to shooter. Standing in at 6-foot, Smothers, a senior and a three-year starter for Black Hills High School’s girls basketball team, had the size and the shot to fill that role. She hasn’t disappointed. 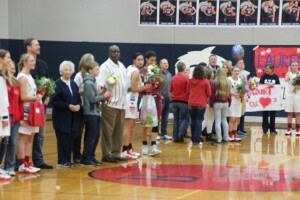 The four seniors on Black Hills girls basketball team were honored during the team’s last home game. 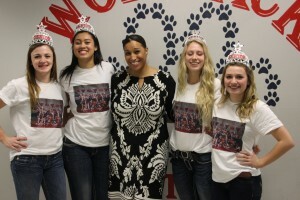 They are (from left to right) Lauren Furu, Shayla Smothers, coach Tanya Greenfield, Lexi Tarrow, and Caitlin Grimm. 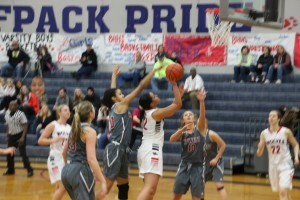 After averaging about seven points last year on a team filled with shooters and that reached the regional playoffs, Smothers boosted her average to 16 points a game this season. “I felt I had to do a real big step up in scoring,” Smothers said. It was a mental adjustment for Smothers. Before she’d become a scorer, she’d first have to become a shooter. It’s been a winning formula. Black Hills, with a freshman at point guard, is 14-7 heading into the district playoffs, even surprised their coach. 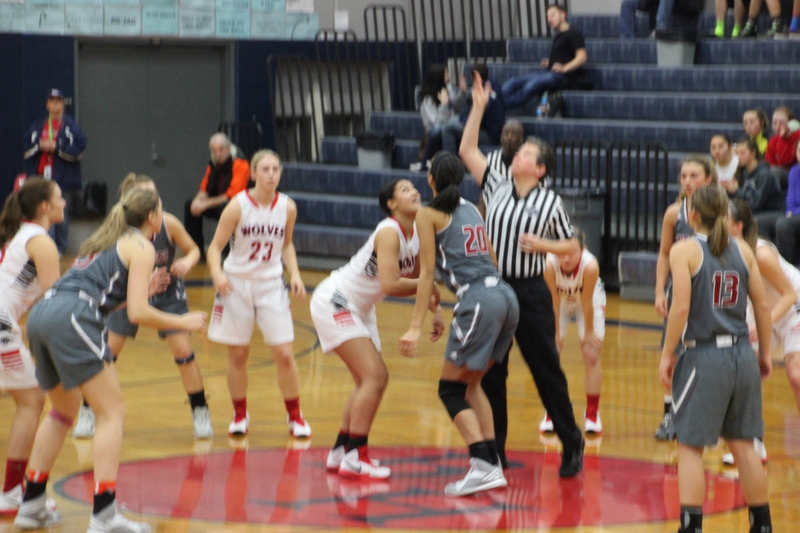 With a young and talented Lindsey Nurmi, a freshman, at point guard, the Wolves have been the surprise of their league, finishing in second place. “She’s exceeded more than I expected, actually,” said Tanya Greenfield, who is in her third season as Black Hill’s head coach. But like Smothers’ adjustment to be the go-to scorer, Nurmi had to adjust to high school basketball. As result, so have the Wolves. But before Nurmi could be that effective passer, she had to gain in confidence. And the team had to gain confidence in her. “We went through some growing pains,” Greenfield said. Nurmi had a secret edge to helping her make that leap from middle school basketball to high school varsity. It was her sister, Nicole, who started for Greenfield last year as a senior. To help Nurmi, Greenfield has rotated Emma Duff and Nurmi at point guard. But Duff is only a sophomore and also had some growing up to do. Game time has helped solve that. 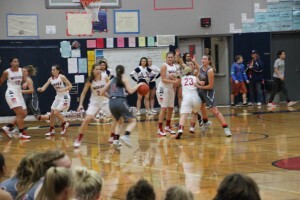 The Wolves play some tight defense against Chehalis. Besides Smothers, the Wolves have also been getting points out of Duff and Meeri Gummerus, a foreign exchange student from Finland who is 6-foot and plays forward. They’re both averaging about 10 points each. Lauren Furu, a 5’9″ senior guard, has been another important cog to the Wolves’ success. Her contribution isn’t so much points scored, although she is averaging six points. As a team captain, it’s more of an emotional lift. She’s the designated encourager. Despite her team’s inexperience with just one starter returning, Furu came into the season optimistic. She liked what she saw during the summer league. Senior forward Shayla Smothers puts up an inside shot against Chehalis. From the start of the season, Smothers has been the steady scorer her team needed her to be. She scored a season-high 23 in a 66-59 win against Puyallup. Then she had 21 in a 67-57 win against Kelso and 20 in a loss against Timberline. Basketball is in Smothers DNA. Her father, Steve Smothers, played basketball at Saint Martin’s University in the late 1980s. She’s played basketball since she was in grade school, showing talent from the start. She hopes to play in college next year. All along, Shayla hasn’t just focused on playing basketball. With her 3.5 GPA, she’s a true definition of student-athlete. On the Wolves’ final home game of the season, their four seniors and their parents were honored. Greenfield has watched her team grow up this season. She saw the good and the bad when she watched her team jump out to an impressive 12-4 lead after the first quarter against league-leading Chehalis. But the Bearcats recovered and pulled out a 55-29 victory, outscoring Black Hills 51-17 over the last three quarters. The 2A district playoffs begin February 11 at Saint Martin’s University.